Demonstration WiMax base stations and user terminals were able to handle HD TV. Mobile WiMax wireless data communications continue to make rapid strides in the race to establish a long-range alternative to Wi-Fi, with the latest breakthrough being a demonstration of wireless high-definition TV broadcasts. 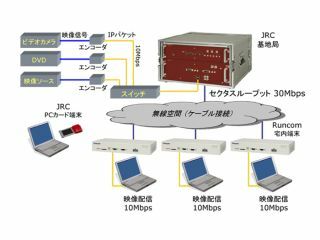 Using a tweaked IEEE802.16e setup, Japan Radio Company (JRC) and Runcom Technologies recently showed HD TV video being transmitted at 30Mbit/s, which was more than enough throughput for the high-quality images. The two companies combined their wireless expertise to create a base station and user terminals using WiMax IEEE802.16e-2005 on the 2.5GHz portion of the radio spectrum. Emphasising the significance being placed on WiMax to challenge other technologies, JRC general manager Fumio Murakami said: "Japan ... is expecting superior performance from the WiMAX networks to compete with the existing broadband wireless networks in the country; The collaboration with a pioneer ... such as Runcom supported JRC in its plan to demonstrate such performance to the leading operators in Japan." While any large-scale commercial deployment of WiMax specifically for video broadcasts remains uncertain, it's clear that, whatever it is used to transmit, the standard has a bright future.